Whether rehabbing your house for selling, or simply renovating it for a lifestyle, you must be aware of the things you need to know on property renovation in order to avoid mistakes. Without careful planning, renovation might cost you more on future repairs and other issues. 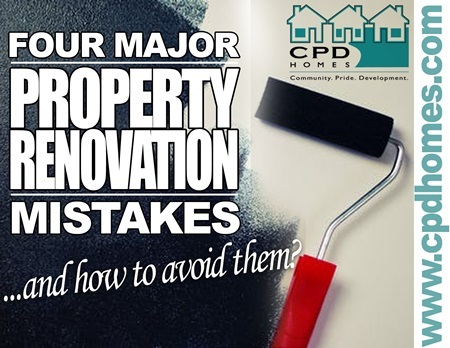 As a guide, we enumerated some property renovation mistakes so you can avoid doing such steps. Though there’s no one way to approach a successful home renovation, these helpful tips will help keep your budget sound and mind focused. Ignoring Budgetary Requirements. There are two aspects to a renovation: The stuff you want to do, and the stuff you have to do. Make sure you know the difference, and that you first spend your hard-earned money on must-do items. Therefore, avoid buying materials, especially the expensive ones, which are not actually needed or maybe replaced by a standard one. Always prioritized the budgetary factors after all the planning, and apply these in the purchasing and renovation stage. Jot down all the possible financial downfalls or spikes and have backup plans in case of unforeseen bumps in the road. Ensure before a remodel that you are financially ready to pay for unforeseen problems, while also having enough for necessary spending outside of the remodel. Not Forecasting Future Requirements. Think kids, pets, and future buyers. Do this before knocking down walls, turning your backyard into a koi pond, or transforming that third bedroom into a killer master closet. Critical thinking on future requirements are essential in planning for house renovation. So think ahead before knocking down walls. Altering structural elements, relocating pipes, and moving electrical utilities are not cheap processes. Plan accordingly. Ignoring Housing Laws. Go through the correct approval process before you dig, tear down, gussy up, or add on. If you don’t seek prior approval, you may be asked to revert your project to its former condition. Chances are, at least one of your neighbors has been through a home renovation of their own—and their digs may be similar to yours in style and age. Communicate with them and inquire about these concerns. Besides, it’s a natural way to establish healthy, long-term relationships within your new community. Therefore, do not get caught disregarding safety rules, street laws or home inspections as you can quickly lose your efforts, money and positive references for future clients. Not Hiring the Professionals. Nothing is worse than wasting your time (and money) on a project that you’ll have to pay someone else to re-do later on. Getting the right people to do the job is a must in any property renovation. Make sure to talk to highly-skilled people or contractors that have enough years of experience to do the job! And if you wanted to know more about this topic, you may contact us at CPD Homes through our landline at 216-282-4332, or shoot me an email at wendy@cpdhomes.com! We’ll be more than happy to assist you about any concerns on how to avoid property renovation mistakes, and a lot more related topics!